Capacitive ‘touch switches’ manufactured using ADS’s leading edge IMD technology with integrated active electronic circuitry in a high volume production component for the first time. IMD (InMold Decoration) allows the panel to be ergonomically styled in three dimensions without complex assembly operations while maintaining a surface free of extensive join lines. The capacitive sensors and associated wiring are printed in specially formulated silver-loaded conductive ink which, when combined with ADS’s proprietary decorative inks, allows the circuit to be formed into a complex 3D shape. In the early 1980s, British innovator Sir Clive Sinclair, who earlier produced the ZX81 and ZX Spectrum personal computers, developed a low-cost “laptop.” The Z88 was ahead of its time in the area of portable computing, and it was not much bigger or heavier than Apple’s® iPad®. 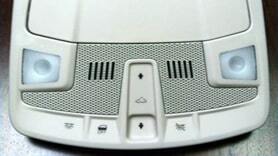 A key feature of the device was the flexible, screen-printed circuit that integrated with the keyboard. 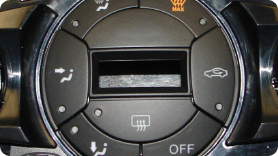 Produced by ADS in our European location, this single-layer membrane switch component worked with the ultra-thin keypad to provide the user a seamless typing experience for such a compact unit. The circuit itself is deceptively simple, but harnesses a lot of technology. 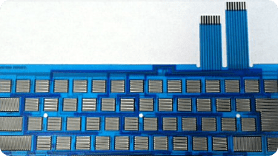 Packaging density is enhanced by this early example of cross-over (multi-layer) circuitry, and the silver conductive parts are protected from oxidization with a combination of the printed protective dielectrics and conductive carbon coatings. Today, ADS continues to apply the lessons learned from this project in our innovative “touch switch” products. 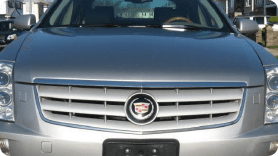 GM provided ADS with quite a challenge when they ordered a front-grille logo badge for the Cadillac STS with the ACC (adaptive cruise) enhancement package. A unique blend of design and engineering, the logo badge would protect the vehicle’s radar to ensure an unobstructed view of the road ahead. The specifications required ADS to produce Cadillac’s iconic 3D image in 2D, while maintaining the metallic look of the design, without using any real metal or conductive carbon. In addition, the part needed to be plastic, able to survive the weathering any exterior component would face, and strong enough to endure anything the road ahead might throw at it. To solve the problem and address all the customer’s needs, ADS employed several unique strategies: We used clever shading to render the part in 2D; we included ceramic flakes in the silver ink to maintain the metallic look without the metal; then we developed a custom, carbon-free black ink, and coated the product with a state-of-the-art UV lacquer. The result is beautiful, functional, and practically invisible to the end user. What do you do to make a computer mouse look and feel like a high-end computer mouse? In a word – leather. 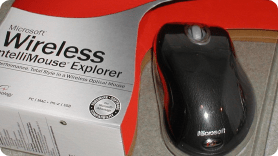 For this Microsoft-branded computer mouse, ADS developed a unique process in collaboration with another company. The product presented a number of challenges. Identify an existing material with the desired look and feel. Create a process to reproduce that look and feel in plastic. Develop a technique that allows that plastic leather to be molded into a semi-rigid final product. ADS worked closely with a sub-division of the DOW Group. DOW was able to laminate the original fabric to a plastic ‘carrier’ sheet, which ADS then used to create a thermo-form of the required shape. Another challenge arose in this process because the 3D trimming required a clean, thread-free edge. To overcome this, ADS developed/adapted an advanced, two-shot IMD technique to successfully enclose the edges of the part in a soft touch plastic. The result? 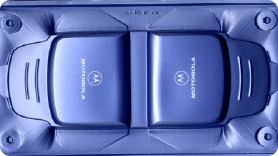 The main cover of the mouse is an ADS-produced InMold decorated part in which the normal printed foil is replaced with a simulated leather fabric to give the end product the look and feel of real leather. As a long established supplier of IMD products, the process of Painting and Laser Etching plastic components was often considered as a rival technology to ADS’s traditional techniques. However, as our customers demand higher level assemblies it is clear that PLE is a complimentary technique to IMD and many of our products actually feature both techniques on the same component. The technique involves injection molding plastic parts and then painting them, often in multiple layers. The painted parts are then placed in a holding fixture and a highly accurate powerful laser etches through the outer layer of paint to reveal the painted colors below. In some cases the laser will etch through all of the paint to reveal the color of the injected resin below. 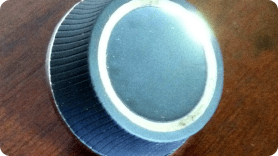 The brief for ADS in this application was to produce a rotary control knob in which the main body was a soft touch elastomer type material but which also featured decorative chrome highlights on the face of the part and on a skirt around it’s base. The company met the challenge by applying its experience in two-shot decorative molding. The first shot is made in a rigid plateable grade resin giving the part it’s basic shape and inherent strength. This part is then chrome plated in the conventional matter. The plated first shot is returned to the molding process where a second shot of the elastomeric material is made to complete the part. The elastomer resin is allowed the run through a series of ‘anchor holes’ on the first shot to increase the adhesion between it and the chromed base.